Place bacon on a paper-towel-lined plate and cover with an additional paper towel. Microwave on high for 3 1/2 minutes or until bacon is almost completely done. Sprinkle with sugar and microwave uncovered for 1 minute more. Let cool completely. Alternatively, heat oven to 400°F. Place bacon slices on a rack, placed on top of a baking pan. Cook bacon on the top rack of the oven until almost completely crisp, about 18 minutes. Sprinkle bacon with sugar and cook 5 minutes more. Remove bacon immediately from rack to prevent sticking and cool completely. Combine all ingredients in a shaker. Pour over ice into two glasses. 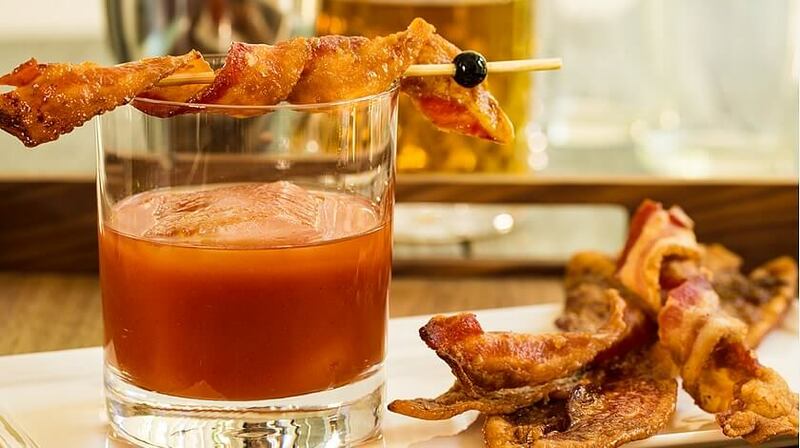 Then garnish each with a slice or two of Candied Bacon.